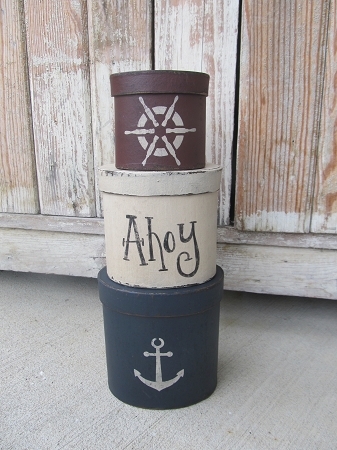 Nautical Beach Rustic Anchor and Ship Helm Set of 3 Oval Stacking Boxes. Love this new stacking box design. Perfect for your nautical coastal beach decor. The bottom box is a traditional navy blue color with a marshmallow colored anchor. The middle box is marshmallow with the saying AHOY. You can choose your favorite from the list. The top box is burgundy with the ship wheel helm in marshmallow. All boxes were sanded and stained for a worn rustic look. Size stacked up is 12" tall and the bottom box is a 5" oval. Hand painted, designed and signed by Heidi.